We are now in sunny southern California and really enjoying all that this different climate has to offer. Many of the plants and animals found here are unique to this and adjoining areas making it interesting for birders like us. The first day that we were here a Black Phoebe landed in a shrub in our daughter’s back yard. It did not do very much save for sitting for a few minutes and then flying off. Even though it did nothing exciting it did provide me with a topic for this week. 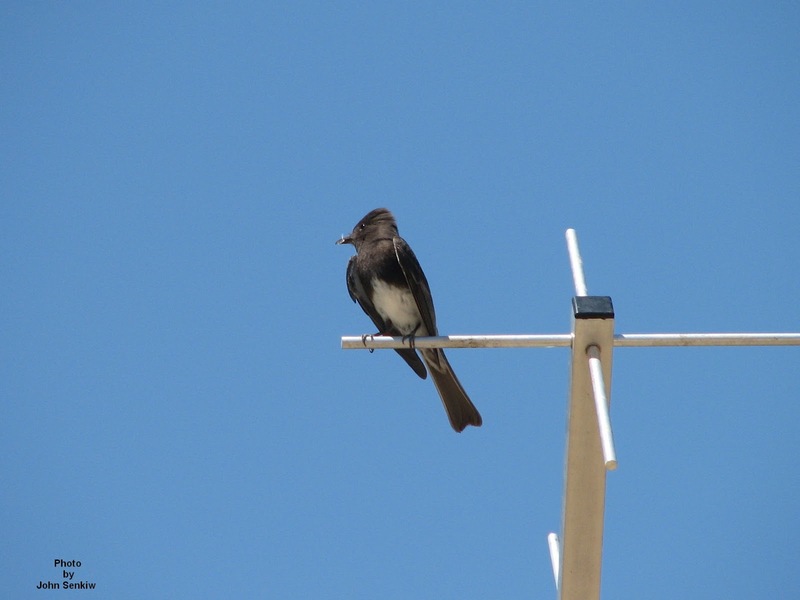 The Black Phoebe is common throughout the American southwest wherever there is water. Any desert spring or stream is always surrounded by lush vegetation and a pair of Black Phoebes will almost always be present. In short, although Black Phoebes live in desert areas, they really are not desert birds at all. The Black Phoebe is a typical flycatcher sitting on a prominent perch then suddenly flying out to snag a flying insect. When perched, Black Phoebes, like all flycatchers, sit in a very upright or erect fashion. This characteristic is very useful in identifying flycatchers in general as most perching birds sit in a more horizontal position. In terms of field marks the Black Phoebe is very easy to identify. It is a sparrow sized black bird with a clearly defined white belly and white outer tail feathers. The only bird that it could be confused with is the slate coloured form of the Dark Eyed Junco. This is not very likely as the two species behave very differently. Although the Black Phoebe is very common right here in Carlsbad this week’s picture was taken several years ago in Big Bend National Park in Texas. This one was sitting on a communications antenna. Yesterday, we saw our first Baltimore Oriole of the year which means that the last of the summer migrants are finally here. As yet I have not seen a Yellow Warbler nor a House Wren but they will probably be here before this article goes into print. We have set out grapefruit halves for the oriole and, hopefully, we have the same success in attracting the oriole as we have had in the past. 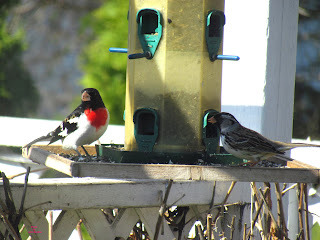 For the first time ever we had a male Rose Breasted Grosbeak at our black oil seed feeder. He stayed for three days and then was gone, probably flying away to the nesting grounds in and around the Boreal Forest. A small flock of Goldfinches have since made up for his absence. As I mentioned in Article No. 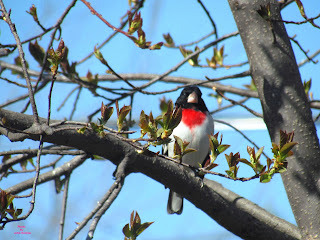 92, the male Rose Breasted Grosbeak, in my opinion, is our most beautiful bird. This time I was able to get some good photos of a male in his finest spring plumage in bright sunlight. They turned out so well that I decided to use them in this week's article. 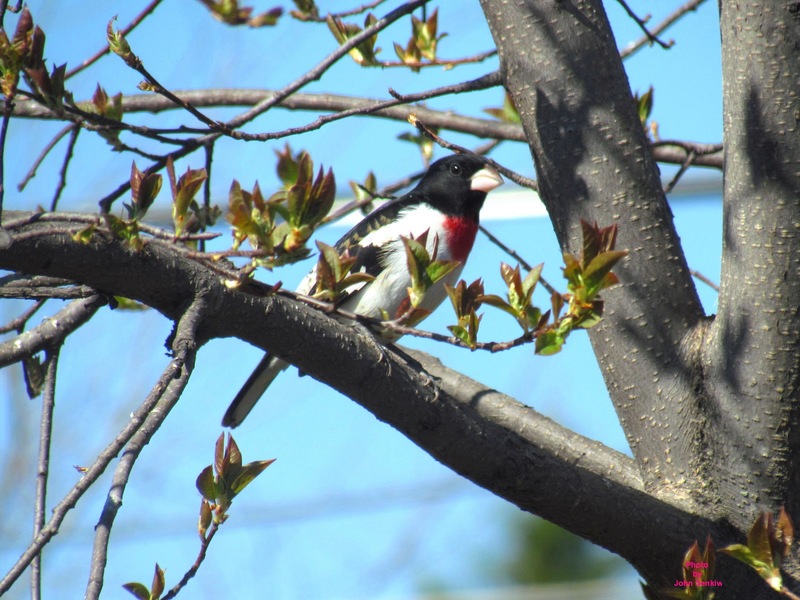 In black and white the grosbeak looks quite ordinary but in colour he is something else. One picture has him at the feeder with a Harris Sparrow; the second and third have him perched in a tree nearby. Check my website at www.johnthebirder.com to see the grosbeak in his striking colours. For the next little while we will be in southern California. During that time I intend to write about some of the birds that are common to that area but not necessarily confined to it. The absentees of last week (the Harris Sparrow, Lincoln's Sparrow, Pine Siskins, Goldfinches, and Swainson's Thrush) are all here now in our yard. Once the trees start leafing out in earnest the last of the summer arrivals like the Yellow Warbler, Baltimore Oriole and House Wren will be here. Then it is nesting time. With the warmer weather we are now sleeping with our window open to breathe the nice fresh air throughout the night. A fringe benefit is that we also get to hear birdsong in the late evening and early morning. Some people find this very annoying but my wife and I find it soothing. 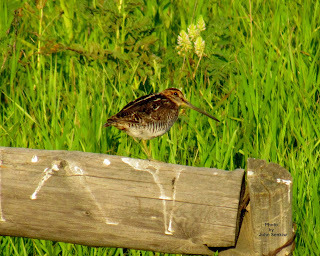 One of the bird sounds that we find very relaxing is that of the Wilson's Snipe. I used the word "sound" instead of "song' for a reason. During the spring courting season the male flies up from his perch, and after gaining altitude, goes into a shallow dive. After gaining speed the air passing through his tail feathers produces a hollow whistling sound best described as 'wu wu wu . . .". He then pulls out of his dive and repeats the process. Sometimes, instead of diving, he will fly in a straight line parallel to the ground and then suddenly turn into a flat curve with the same resulting sound. The sound is often referred to as "winnowing". Several males performing in the same area put on quite a performance - at least for birders. In Eastern Canada the somewhat similar Woodcock does something much the same but less dramatic. The Wilson's Snipe, a Robin sized wader, is a relatively nondescript brown and white bird with an extremely long bill. Although it is a wader it is somewhat of an upland bird often seen sitting on fence posts, light standards and so on sometimes quite far from water. In the late fall small family groups are found along edges of larger sloughs as long as the shore lines are not frozen over. When flushed they fly away in zig zag fashion while uttering a loud and harsh "scape". It is a game bird and for many years I tried to bag one to see how palatable it was but, no matter how hard I tried, the snipes always managed to surprise me and fly away before I could get my bearings. I took this week's picture last July just south of Monmartre near the motel that we were staying at. Judging by the amount of "white wash" on the rail it must have spent a lot of time perched on it . This Thursday, morning as I watched a very rainy and windy day unfold, I was pleased to see the arrival of the last of our transient birds. 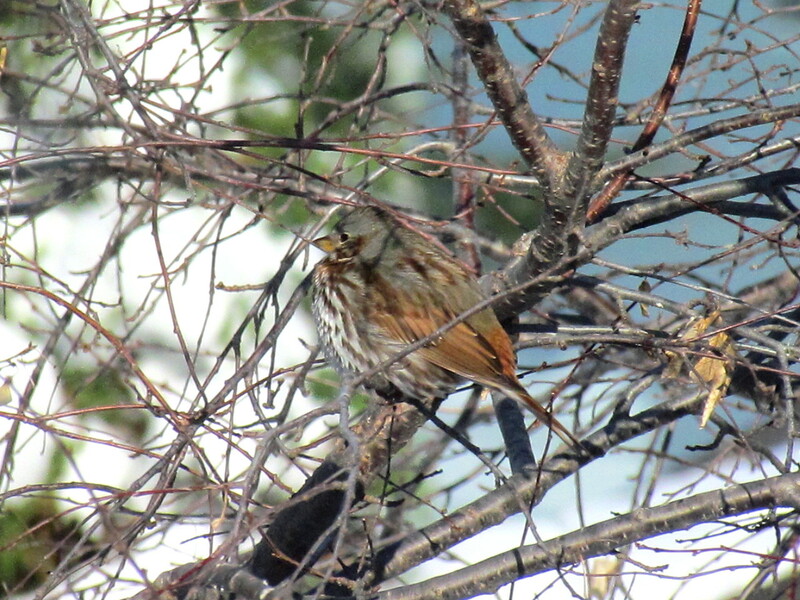 So far only the White Crowned and White Throated sparrows have arrived but the Harris Sparrow, Lincoln's Sparrow and Swainson's Thrush cannot be too far behind. As we were watching the new arrivals a Cooper's Hawk suddenly flew into our back yard and landed in a tree near the feeders. At the moment the hawk appeared all the birds including the Grackles and Robins disappeared. The hawk sat for a few moments and before I could get my camera it flew off. Almost immediately after the hawk flew away the Robins returned followed by the rest soon after. 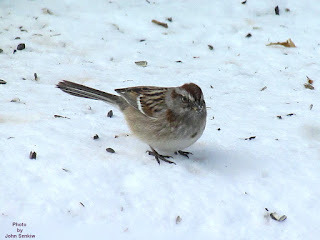 The transient bird that I will cover this week is the American Tree Sparrow. This close relative and lookalike of the ever present Chipping Sparrow is quite common in rural areas but not so in urban ones. Both species sport stripy brown wings, tails and backs with soft grey breasts and bellies topped off with rusty red caps. The real difference is that the Tree Sparrow has a smallish black spot in the middle of its breast whereas the Chipping Sparrow never has. However, both my wife and I had a tough time identifying this bird at first because it did not look like anything that was pictured in the common bird books. Our bird most closely resembled a Tree Sparrow except that it was too dark and also had some faint breast striping near the shoulders of the wings. In many ways it also resembled a Lincoln's Sparrow. Finally my wife looked at the Ken Kaufman guide and there it was - the American Tree Sparrow. Kaufman's guides use actual photographs instead of paintings which is usually a handicap but not in this case. Kaufman's photo and mine looked exactly the same. The point to all this is that birds are not clones and sometimes there is considerable variation between individuals of the same species as was the case here. In such situations a variety of guides are very beneficial in identifying aberrant birds. This week's photo of the American tree Sparrow was taken in our back yard right after the April snow storm. We are home and managed to dodge all the bad weather on the way back. On the birding front the trip back produced only one event of note. We ran across, literally, two small flocks of wild turkeys. In the first instance the flock was crossing the road in no particular hurry and had traffic stopped for a brief moment. In the second instance a similar sized flock was feeding alongside the road. Both groups seemed to be very road wise unlike domestic fowl. We arrived in Foam Lake in 22C temperatures only to wake up next morning to colder temperatures and rain followed by snow the day after that. I cannot say that I enjoyed the bad weather but the backyard birding is usually very good during stormy weather especially if feeders are present. Birds that are normally secretive and distant will come to feeders in harsh weather conditions. Hunger is a powerful motivator. However, once conditions improved the uncommon backyard birds were gone. During the Saturday of the snowfall we had a higher concentration than usual of our regular visitors such as the Juncos, House Sparrows and Purple Finches. A pair of Fox Sparrows, uncommon at best and secretive if present, were out in the open feeding on the ground on seeds scattered by birds from the feeders above. They were joined by an American Tree Sparrow which seldom comes to towns and was never recorded in our yard previously. Perhaps the most surprising of all was a pair of crows feeding on the same seeds that the Fox and Tree Sparrows were. This was a first for us. I know that I am in the minority with this opinion but I simply like crows. Their arrival every year signals the end of winter and the coming of spring - a nice thing. Finally, we felt sorry for the Robins so my wife tossed out a handful of raisins on the snow for them to eat. They found them but it was comical watching them struggle with the raisins. Instead of picking up the raisins in their bills and simply eating them, they tried pecking at them for some reason. The result was that the raisin was driven a little into the snow. On the next peck it would sink even deeper and so on until the Robin had its head well into the snow still chasing the raisin. In between pecks it would withdraw its head and vigorously spit out the snow that had loaded up its bill. Eventually the raisin would be retrieved after which the robin would fly into a nearby tree and eat it. On that day the birds did provide us with some amusement. Both of this week's pictures were taken during the snow storm so they are not as bright as I would have liked but they are acceptably clear. The flock of ground feeders include Juncos, House Sparrows and Purple Finches. 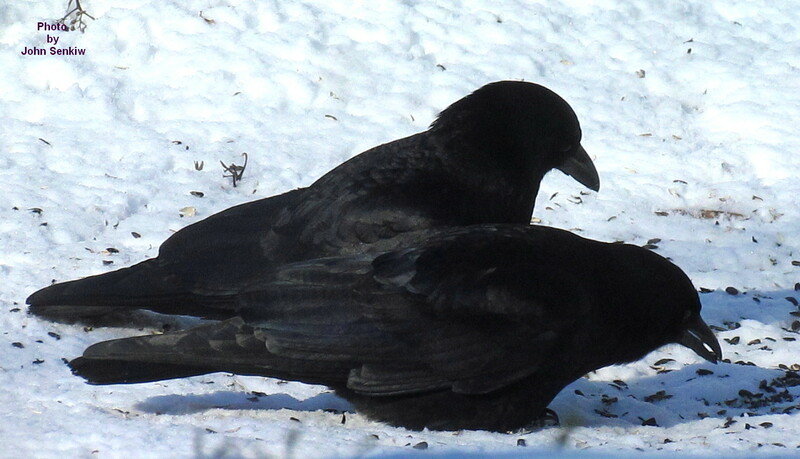 The two crows simply looked cute.